Joint stability in the hip region is achieved through the labrum (a strong fibrous cartilage), which covers the acetabulum and seals it, and ligaments (tissue connecting bone to bone) and tendons (tissue connecting muscle to bone) that encase the hip and control the hip movements. Unfortunately, many conditions can restrict movement and cause pain in the hip — Dancer's hip is one condition that can cause discomfort for active people. Dancer’s hip, also called snapping hip syndrome, is a condition that causes you to hear or feel a snapping or popping sound in the hip while swinging your legs, running, walking or getting up from a chair. Movement of the muscles or tendons over a bony protrusion in the hip region gives rise to the snapping sound, which can occur in the back, front or side of the hip. Though hip popping is usually painless and harmless, it may be accompanied by pain and weakness in some. In some cases, snapping hip leads to bursitis, a painful swelling of the fluid-filled sacs that cushion the hip joint. Dancers and athletes who have to repeatedly bend the leg at the hip are the most vulnerable to snapping hip syndrome. The hip is a ball-and-socket joint formed where the rounded end of the thighbone (femur) fits into a cup-shaped socket (acetabulum) in the pelvis. The acetabulum is ringed by strong fibrocartilage called the labrum that creates a tight seal and helps to provide stability to the joint. Encasing the hip are ligaments that surround the joint and hold it together. Over the ligaments are tendons that attach muscles in the buttocks, thighs, and pelvis to the bones. These muscles control hip movement. Fluid-filled sacs called bursae are located in strategic spots around the hip to provide cushioning and help the muscles move smoothly over the bone. Where Does Snapping Hip Happen? Outside of the hip: The most common site of snapping hip is at the outer side where the iliotibial band passes over the portion of the thighbone known as the greater trochanter. When the hip is straight: the iliotibial band is behind the trochanter. When the hip bends, the band moves over the trochanter so that it is in front of it. The iliotibial band is always tight, like a stretched rubber band. Because the trochanter juts out slightly, the movement of the band across it creates the snap you hear. Front of the hip: Another tendon that could cause a snapping hip runs from the front of the thigh up to the pelvis (rectus femoris tendon). Snapping of the rectus femoris tendon is felt in the front of the hip. As you bend the hip, the tendon shifts across the head of the thighbone, and when you straighten the hip, the tendon moves back to the side of the thighbone. This back-and-forth motion across the head of the thighbone causes the snapping. In addition to the rectus femoris tendon at the front of the hip, the iliopsoas tendon can catch on bony prominences at the front of the pelvis bone. Back of the hip: Snapping in the back of the hip can involve the hamstring tendon. This tendon attaches to the sitting bone, called the ischial tuberosity. When it moves across the ischial tuberosity, the tendon may catch, causing a snapping sensation in the buttock region. Cartilage problems: The labrum that lines the socket of the hip can tear and cause a snapping sensation. Damaged cartilage can loosen and float in the joint causing the hip to catch or "lock up." This type of snapping hip usually causes pain and may be disabling. (Left) This front-view of the hip and thigh shows musculature most often associated with snapping hip: the iliotibial band, rectus femoris tendon, and iliopsoas muscle. (Right) The biceps femoris hamstring muscle travels under the gluteus maximus and can snap as it moves over the ischial tuberosity. Is Snapping Hip Syndrome Serious? In most cases, dancer's hip is not serious, though you may find the snapping sensation annoying. However, the syndrome can also lead to bursitis, a painful swelling of the bursae, which are fluid-filled sacs that surround and cushion the hip joint. For athletes and dancers, snapping hip syndrome may be a greater concern, since it can sometimes limit movement and create weakness that impacts performance. Eventually, snapping hip may lead to hip bursitis. Bursitis is thickening and inflammation of the bursa, a fluid-filled sac that allows the muscle to move smoothly over bone. The most common cause of snapping hip syndrome is tightness in the muscles and tendons surrounding the hip. Such tension can result from repeated use of these muscles, which is why dancers are particularly prone to hip popping. Sometimes, a loose piece of cartilage, cartilage tear or pieces of cartilage or bone in the joint space can lead to a hip snapping sensation, as well. This may also lock the hip, causing disability along with the pain, though this is less common. Snapping or catching in the hip can also be caused by tears in the labrum or damage to the cartilage that covers the bones of the joint. When you see an orthopedic doctor like Dr. Gombera, finding the underlying cause of your snapping hip will likely be your first priority. Your doctor will discuss your medical history and symptoms with you and conduct a physical examination to detect the exact cause of snapping. At this appointment, you may be asked to reproduce the snapping sound by moving your hip in different directions. Your doctor may also order imaging tests to rule out bone and joint problems. What Are the Different Types of Dancer's Hip? Internal Dancer's Hip: The most common form of snapping hip syndrome, internal dancer's hip occurs when a tendon slides over a bony protrusion on the front of the hip joint. 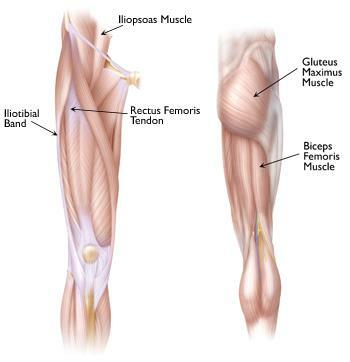 Usually, the muscle responsible for internal hip snapping is either the iliopsoas tendon, which connects inner hip muscles to the thighbone — or the rectus femoris. You might hear these muscles conversationally called hip flexors. External Dancer's Hip: The next type of dancer's hip, external snapping, occurs when a muscle or tendon — usually the iliotibial (IT) band or gluteus maximus — catches on the top of the femur, a region of bone called the greater trochanter. This type of snapping may indicate that the IT band or gluteus maximus is tense or overworked. Hip Snapping Due to Injury: The final type of dancer's hip is caused by a cartilage injury, not just tense muscles. Sudden trauma can cause tears in joint cartilage or loose matter in the hip socket, which can lead to a snapping sensation. If you have a cartilage injury, you may also experience pain, a catching sensation and restricted movement. Does Snapping Hip Syndrome Go Away? Often times, a snapping hip will go away on its own following a break from physical activity. However, because dancer's hip is related to overuse, you may have to intentionally take action to address it. Do You Need Surgery for Snapping Hip Syndrome? Physical Therapy: Your doctor may teach you certain exercises to strengthen and stretch the musculature surrounding the hip. Particular tendon stretching exercises such as iliotibial band stretch and piriformis stretch will be indicated depending on the type of snapping you experience. Steroid Injections: Your doctor may recommend a corticosteroid to be injected into the bursa to reduce the pain and inflammation in the hip joint. 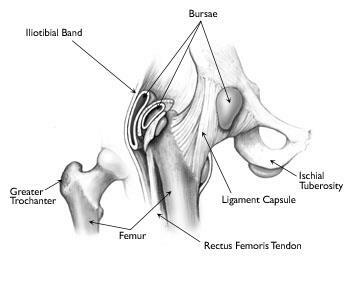 Hip Arthroscopy: This procedure treats dancer's hip by removing or repairing the torn labrum. Your surgeon will insert an arthroscope (small camera) into your hip joint so that surgical instruments can be guided with the help of images displayed on a large screen. Very small cuts are required for this procedure due to the presence of a small arthroscope and surgical instruments. Open Procedure: Open surgery can help your surgeon gain better access to the hip problem causing snapping to occur. Your surgeon will make an open incision of several centimeters to resolve the issue of snapping hip. Before recommending a course of action, your surgeon will discuss the best options depending on your situation. As with all medical procedures, the right surgery for you will depend on your specific needs and injury. Looking for Treatment for Dancer's Hip in Texas? At best, the snapping caused by dancer's hip is a nuisance — at worst, snapping hip syndrome can restrict your range of movement, cause pain and inflammation and keep you from doing the activities you love. In order to help patients like you perform your best, we provide treatment for dancer's hip to patients in Houston, Beaumont and Cypress. Before recommending surgical options, Dr. Gombera will work with you to find a personalized and often non-surgical care and recovery route. To schedule an appointment to discuss treatment options for your snapping hip, reach out to us today.